I started my outdoor life with Bushcraft. A naturalist at heart, I don’t just enjoy being in nature; I believe in being one with nature. Bushcraft is the art of being able to spend time outdoors with very few items because you have a better understanding of the natural world. In other words, you have excellent “wilderness skills.” Englishman Ray Mears popularized the term “Bushcraft” here in the United Kingdom in his TV show, “Wild Tracks.” His show brought his survival research across the world to the big screen and left a lasting impression on my seven-year-old self. Like Mears, when I walk in my woodlands, I don’t just see trees and plants, I see food I can eat and resources that I can use to do tasks. For example I very rarely carry tent stakes with me, as I know that I can just use branches with a carved point on the end. However, I also have a set of tent takes I have carved out of Hazel straights for when I’m in mossy areas. Wood work, fire lighting, shelter building—with the right knowledge the possibilities are endless. 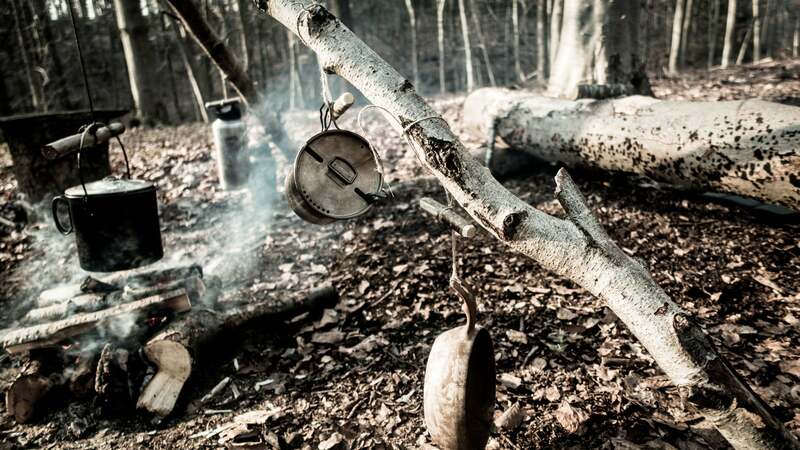 A bushcrafting campsite differs greatly from the site of a typical ultralight hiker. 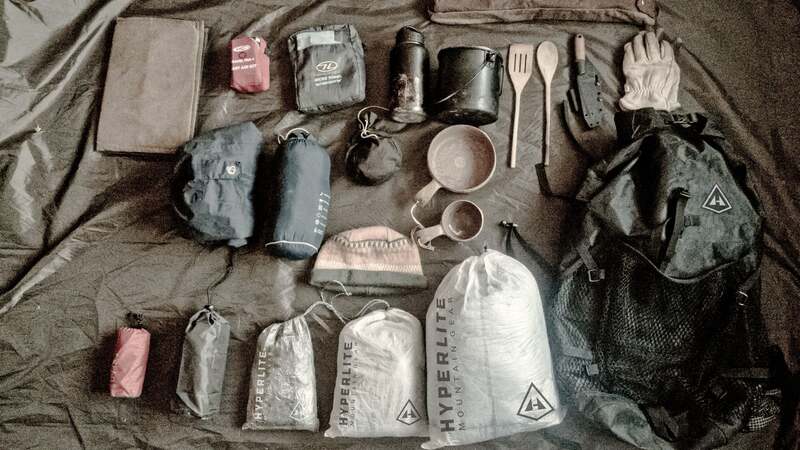 There is a basic list of what every typical “Bushcrafter” takes into the woods. I like to base mine on the “5c’s of survivability” by Dave Cantebury. All of these items cannot be re-created in nature, so they have to be carried in. Everything else we can make while out in the woodlands. Cutting Tool—I choose a 4” full tang blade because it’s strong and able to be put under a lot of pressure when working with wood. Combustion—A form of making fire is essential and practicing fire lighting skill is very important. So I carry a pouch with a few different methods in it to practice, including flint and steel, a magnifying glass and fire steel. Cover—Everyone has their preferred choice of shelter. As a naturalist, I like to be as close to nature as possible, so I put up a high tarp to keep the rain off me. This still allows me to see everything around me and feel the wind on my face. There is nothing better than waking in the morning and seeing the sun rising through the trees while listening to the birds sing. Container—A form of steel container is something than cannot be constructed from natural materials so has to be carried in. Most people go for a billycan. However, I am completely sold on the Mors Bushpot, as its bail handles and spout make pouring my coffee that much easier! Cordage—Cordage is used for more things than you may think including, putting up your shelter, hanging your hammock, making a cooking tripod or hanging your pack on a tree. It’s a vital piece of equipment, and I always choose bank line for its high breaking strain to its pack size. Traditionally Bushcraft equipment is heavy, and many Bushcrafters carry classic equipment like canvas tarps and leather rucksacks. It’s cool and authentic, but I prefer my hybrid lightweight version. Because I want to stand on higher mountaintops and travel longer distances, I needed to consider other options besides strapping a 55-pound rucksack to my back. Enter ultralight. I started researching this new philosophy of traveling light, and began absorbing all the information I could. 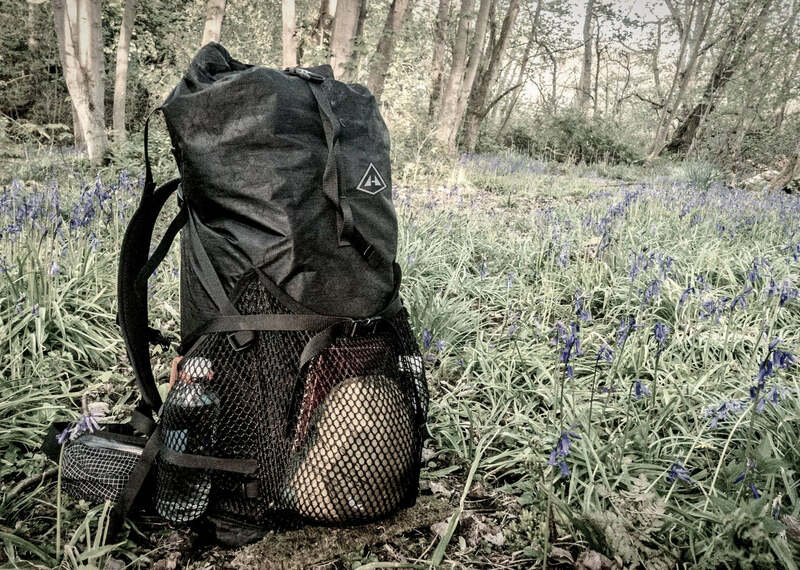 Now I am one of only a few ultralight backpackers here in the United Kingdom, and my base weight never rises above 20lbs. Now with hundreds of miles under my belt, I can say that ultralight is definitely the only way to go when traveling long distances. I still carry some traditional bushcrafting items when I’m not traveling too far, such as my bushpot (because it’s much better for cooking over a fire), but I shave off significant weight with my lightweight sleeping pad, down sleeping bag and ultralight shelter. I’ve also replaced my bank line with Dyneema® cordage because it packs so small, and I cut my fire kit down to just the basics to help reduce weight. I have actually got to the stage now where I have the weight of every individual item on a spread sheet so I can work out how heavy my pack is going to be. I ditched my huge canvas pack for a 55L Windrider, so I no longer need an 80-liter canvas bucket for all the bulky equipment. Plus the new pack is waterproof so I can leave it out in the rain, and believe me it rains a lot in the United Kingdom. 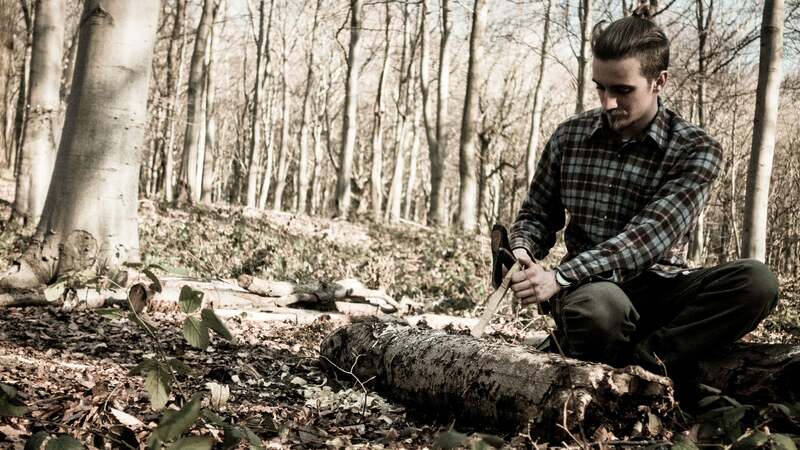 Generally Ultralight isn’t a thing here in the United Kingdom, especially in the Bushcraft community, where everything has to be long lasting and durable. So most bushcrafters apparently think that means it needs to be heavy. I’m glad I have found out that this is incorrect. I am trying hard to spread the word of ultralight here as it just makes so much sense! Brian Trubshaw’s gear load out before he heads into the woods. Not as light as when I’m in the hills, but a lot lighter than my old 55-pound load. “Nature does not belong to us but we belong to it” – Ray Mears. The post Bushcraft: Making A Heavy Adventure Sport Ultralight appeared first on Hyperlite Mountain Gear Blog.